That is the question–at least that was the question for many Jewish authorities and thinkers, from the Medieval period to the modern age. In light of the increasing popularization among large segments of religious Jews to go on pilgrimages to holy gravesites, (particularly the tomb of R’ Nahman of Bratzlav in Uman, and the recent brouhaha surrounding the tomb of Rabbi Shimon Bar Yohai in Meron) this issue deserves some detail and clarification. Firstly, I think a brief background of the traditional Rabbinic view of this practice, is in order. In the Talmud itself we find contradictory attitudes towards visiting graveyards. in Talmudic times, it appears, that cemetaries were the object of fear and superstition; it was regarded as the dwelling place of demons and evil spirits (see TB Hagigah, 3B; Nidda, 17A). The cemetary was perhaps for this reason located at a distance from residential areas (according to Halakha it is to be located at least 50 cubits from the nearest house). Care, however, was taken to keep the cemetaries and tombstones therein in a respectful manner, the Talmud in TB Sanhedrin 96;B calls Jewish tombstones “fairer than Royal palaces” (although in Ezekiel 43:9, a different sentiment is represented: עַתָּה יְרַחֲקוּ אֶת זְנוּתָם וּפִגְרֵי מַלְכֵיהֶם מִמֶּנִּי וְשָׁכַנְתִּי בְתוֹכָם לְעוֹלָם [Paranthetically, see De Rossi’s Meor Einayim, final chapter on the function of funerary monuments, where he incidentally records the verses he wished to be placed on his own tomb]). We also see in the Talmud that Rabbi Joshua went to the graves of the Disciples of Shammai. קָמוּ רִבִּי חִזְקִיָּה וְרִבִּי יֵיסָא וְאַזְלוּ. אַמְרֵי, וַדַּאי בְּשַׁעֲתָא דְּזַכָּאִין לָא אִשְׁתְּכָחוּ בְּעָלְמָא, עָלְמָא לָא מִתְקַיְּימָא אֶלָּא בְּגִינֵיהוֹן דְּמֵתַיָּיא. אָמַר רִבִּי יֵיסָא, בְּשַׁעֲתָא דְּאִצְטְרִיךְ עָלְמָא לְמִטְרָא, אֲמַאי אַזְלֵינָן לְגַבֵּיהוֹן דְּמֵתַיָּיא, וְהָא כְּתִיב (דף ע”א ע”ב) (דברים יח) וְדוֹרֵשׁ אֶל הַמֵּתִים וְאָסִיר. אָמַר לֵיהּ עַד כָּאן לָא חֲמֵיתָא גַּדְפָּא דְּצִפָּרָא דְּעֵדֶן. וְדוֹרֵשׁ אֶל הַמֵּתִים, אֶל הַמֵּתִים דַּיְיקָא. דְּאִינּוּן חַיָּיבֵי עָלְמָא, דְּאִינּוּן מֵעַמִּין עוֹבְדֵי עֲבוֹדָה זָרָה, דְּאִשְׁתְּכָחוּ תָּדִיר מֵתִים. אֲבָל יִשְׂרָאֵל דְּאִינּוּן זַכָּאֵי קְשׁוֹט, שְׁלֹמֹה קְרָא עָלַיְיהוּ (קהלת ד) וְשַׁבֵּחַ אֲנִי אֶת הַמֵּתִים שֶׁכְּבָר מֵתוּ, בְּזִמְנָא אָחֳרָא וְלָא הַשְׁתָּא. שֶׁכְּבָר מֵתוּ, וְהַשְׁתָּא אִינּוּן חַיִּין. As we shall soon see, Kabbalists, especially post-Luria, popularized the custom of visiting graves to a degree, probably never seen before (on possible Islamic influence see here). The earliest mention of visiting graves, in traditional Jewish literature, is found in the Midrash, which states that when Joseph was taken down to Egyt, he visited the grave of his mother Rachel on the way, and wept (see Sefer Ha-yashar). Rashi on Genesis 48:7 explains why Jacob buried his beloved wife Rachel, in Ramah, on the road to Beit Lekhem: “so that she would be of help to her sons when Nevuzraadan would exile them, and they would pass that way. Then Rachel would come out by her grave and weep, begging God to have mercy on them, as it says ‘ A voice is heard in Ramah…Rachel weeps for her children’ (Jeremiah 31:14) and the Holy One answers her: ‘There is reward for your deed….and the children will return to their borders’ (Ibid verses 15-16). Another popular early legend, is quite similar in this respect. TB Sotah 34A explains the verse in Numbers 13:22: ‘He came to Hebron’: “Rava said, this teaches us that Caleb withdrew from the scheme of the spies and went to pray at the Tomb of the Patriarchs in Hebron. He said to them ‘My fathers, beseech God to have mercy on me that I may be saved from the schemes of the spies’. The Tosafot (ad loc s.v. avotai) interestingly remarks ‘you might object that in Chapter ‘mi she’meito’ (TB Berakhot 18A) the Talmud states that “the dead are not conscious of anything”. And the conclusion reached there is that it applies also to the Patricarchs. The answer is that by means of the prayer, which one prays (when visiting the grave), they are informed that such-and-such has been prayed for’. R. Berechia of Modena sought to bring proof from scriptures that this custom was prevalent in the Biblical period as well; Modena explained the request of David’s ally Barzilai the Gileadite to die in ‘his’ city (‘let me die in my city’ II Samuel 19:38) “so that his relatives could come and visit his grave” (ostensibly to pray), see MY 3:23. The Zohar on Parashat Vayechi writes: “R’ Yitzchak requested three things from R’ Yehuda. One of them was that for all seven days (after his death), the latter would go to his grave and pray for him. A similar scenario is mentioned in the minor Tractate Semachot 4:11: “when Ben Yehozadak died, his brother Yochanan came from the Galillee, arriving after the tomb had been sealed…they said ‘do not become ritually contaminated for him, but open the gate of the cemetery that he may see the tomb”. Without getting into the halakhic details of visiting the grave of a deceased, I will mention a few brief points: Kabbalist custom mandates that one should not visit the gravesite of a deceased person during the first year of his passing. The reasoning given is that the deceased is still going through a time of judgement and therefore it would be inappropriate to pray for blessing but one should pray for the elevation of the soul, instead (some Chassidic sources say that this does not apply to a deceased individual who was particularly great in his lifetime). Lest you think that this a completely Kabbalistic-inspired Halacha, Rabbi David Zvi Hoffman, author of responsa Melamed Lehoil (and far from a Kabbalist or a Kaballah sympathizer) rules that one should minimize visits to the graves of the deceased (even if it is to pray for their souls) in the first year, as well. ראה גם מ’ הילדסהיימר, “קווים לדמותו של רבי עזריאל הילדסהיימר”, סיני נד (תשכ”ד), עמ’ צד הערה 166, המספר שרבי עזריאל הילדסהיימר, מייסד בית המדרש לרבנים בברלין, “התנגד בתוקף לקיום ‘עליות’ לקברים, וכשקיימו הח”ק [=החברה קדישה] בברלין טכס [=טקס] אזכרה על קבר אשתו ביום השנה הראשון, לא השתתף בו”. וראה גם י’ ליכטנשטיין, “עליה לקבר ותפילה שם – דרישה אל המת?”, תחומין כ (תש”ס), עמ’ 191 והערות 8, 9. בין אלה שהתנגדו למנהג ראה: הרב יוסף דב סולבייצ’יק, איש ההלכה, ירושלים תשל”ט, עמ’ 40: “הגר”א מווילנה; ר’ יוסף בר, איש בריסק; ר’ חיים בנו; ר’ משה בנו; ר’ אליהו, איש פרוז’ינא, לא ביקרו מעולם בבתי קברות ולא השתטחו על קברי אבות”. וראה גם הרב צבי שכטר, נפש הרב, ירושלים תשנ”ד, עמ’ רנד. The issue of חיטוטי שכבי: How Conscious are the Dead? Can the Dead Really be Disturbed? Anyone who has followed the news from Israel in the last couple of decades is very familiar with the sensitive issue surrounding the removal of Jewish bones from their resting place. Several years ago, this move by Israeli archaeologists precipitated violent riots by certain segments of the Haredi community. קא מחטטי שכבי – מפני ששמחים ביום אידם, שנאמר: והיתה יד ה’ בכם ובאבותיכם (שמואל א’ יב), אמר רבה בר שמואל: זו חטוטי שכבי, דאמר מר: בעון חיים – מתים מתחטטין. Translation (courtesy of Artscroll) [after citing several verses that have to do with calamities befalling the Jewish people]: R’ Yochanan said these are (referring) to the Chabarim (Rashi explains that these were evil and contemptuous Persians who held no respect for the Jewish people, The Aruch says that the Persian priests were Chabarim, Aruch Hashalem ערך חבר ב’ elaborates that they were zealously religious Zoroastrian priests who believed in dualism and worshipped fire). The Talmud continues a related incident. They told R Yochanan: “The Chabarim have come to Babylonia, upon hearing this he keeled and fell over. They told him further “they are bribe takers”, i.e. they can be paid off. They then told him that the Chabarim have decreed three things (and suggesting that these degrees were punishment, measure for measure because of specific sins of the Jews), …finally they told him they (the Chabarim) are exhuming the dead . R Yochanan replied this was decreed because the Babylonian Jews celebrated on the Chabarim’s holidays. Consequently heaven decreed that the Babylonian Jews should have an occasion to mourn. (The exhumation of the dead is a calamity that is hinted at in scripture), as it is written “But if you do not hearken to the voice of God, and you rebel against the word of God, the hand of God will be against you and your ancestors”. Said Rabbah Bar Shmuel, this verse refers to the exhumation of corpses, for the master has said, due to the sins of those that are alive, the dead are exhumed. Interestingly (and sadly) enough, I came across a reference to this problem, long after the Persians had already embraced Islam. In six letters that have been preserved from the Jews of Hamadan (Jews referred to the city as “Shushan Ha-birah”) in Iran, we find that they were at the receiving end of brutal persecutions by their Persian Muslim overlords, they especially lamented the blackmail tactics used against them in regard to disturbing the final resting places of their loves ones. In the years 1870-71, the community wrote six letters, addressed to various influential leaders (including Sir Moses Montefiore) to assist them. In one of the letters we find :המושלים בכל יום ויום מחטטי שכבי לקדושים אשר בארץ המה סביבות אדונינו מרדכי ואסתר, in other words, in order to force the Jews to pay the exorbitant new taxes, they threatened the community with destruction of the Jewish graves abutting the traditional tombs of Mordechai and Esther. This was hardly a novel idea, in this post, I referred to the rulers of the Crimean Peninsula using the same tactics against the Karaites there. On more of this see י בן צבי, ארץ ישראל ויישובה בתקופה העותומנית, ירושלים תשט”ו עמ’ 278-9. על מצבת מרדכי ואסתר ועל מה שעשו קנאי הדת המוסלמית בה במחצית המאה הי”ט ראה מחברתו של מנחם הלוי “מצבת מרדכי ואסתר אשר בעיר שושן המדאן” ירושלים תרצ”ב ראה בייחוד הפרק אגדת מולא חוסין. הַיֹּשְׁבִים בַּקְּבָרִים וּבַנְּצוּרִים יָלִינוּ הָאֹכְלִים בְּשַׂר הַחֲזִיר ופרק [וּמְרַק] פִּגֻּלִים כְּלֵיהֶם. הָעָם הַמַּכְעִיסִים אוֹתִי עַל פָּנַי תָּמִיד זֹבְחִים בַּגַּנּוֹת וּמְקַטְּרִים עַל הַלְּבֵנִים. The traditional attitude of Judaism was not to encourage excessive grave visitation. The Rabbis were apprehensive frequent visits to the cemetery might become a pattern of living thus preventing the bereaved from placing their dead in proper perspective. They wanted to prevent making the grave a sort of totem, at which the mourner would pray to the dead, rather than to God, and thereby violate one of the cardinal principles of Judaism; that God is one and that there are no intermediaries between man and God (see p. 192). Lamm’s assertion of course brings to mind quite a few difficulties- one of which is the verse in Exodus 23:23, among many others..
“When, for their sins, there is drought in Israel, and such a one as Jose the Galilean prays for rain, the rain cometh straightway” (JT Ber. 9b). There shall not be found among you any one..that consulteth a ghost or a familiar spirit, or a necromancer. So, to sum up, although, Maimonides advises creating some sort of sign (‘nefesh’ refers to a monument or mausoleum) to mark the grave of a deceased person, he deems this uneccesary for the gravesite of a great person, “because their words are their remembrance”. He then adds, “and a person should not visit a cemetery”. One who abstains from eating and goes and spends the night in the cemetery, so the dead person would come to him in a dream and give him a response to his query. And there are those who put on special clothes and chant special chants and burn incense and the like (for the same purpose). Such is the rule, one who engages in any kind of necromancy is gives lashes. אמנם אחרים סברו שלא זאת הייתה כוונתו של הרמב”ם. הרדב”ז , למשל, טען שהרמב”ם התנגד רק לפתיחת הקבר, כמנהגם של עובדי עבודה זרה , “אבל לפקוד הקברות מבחוץ [בלא לפתוח אותם] אין חשש בזה, וכן נהגו כל ישראל לפקוד את מתיהם ולהשתטח על קבריהם”. הריב”ש , ניסה אף הוא להסביר את דברי הרמב”ם באופן שלא יהיו מנוגדים למנהג העלייה לקבר. לדעתו יש להבין את דברי הרמב”ם בהמשך למה שכתב שאין להקים מבנים לציון קברי הצדיקים, ואם בכל זאת הקימו בניין על קברו, “לא יביט אדם לבקר מפני הבנין ההוא, כי אם למעשיהם הטובים יפנה, וזה די להם לזכרון תמיד”. (See also this interesting responsa by R Shimon Efrati of Lithuania where he discusses in detail Rambam’s prohibition against building a mausoleum and visiting gravesites). Lest one think that either Karaites (see the upcoming part II where I will discuss that and Samaritan attitudes in more detail) or the Rambam himself (not to mention the Ari) was entirely consistent in their approach to this issue, we see a reality that is much more complicated. בליל אחד בשבת, ג’ ימים לירח סיוון, יצאתי מן הים בשלום ובאתי לעכו ונצלתי מן השמד והגענו לארץ ישראל. יום זה נדרתי שיהיה יום ששון ושמחה… וביום שלישי בשבת, ד’ חשוון, יצאנו מעכו לעלות לירושלים תחת סכנה, ונכנסתי לבית הגדול והקדוש והתפללתי בו. ובאחד בשבת, ט’ בחודש חשוון יצאתי מירושלים לחברון, לנשק קברי אבותי במערה… ושני ימים אלו… נדרתי שיהיו יום טוב ותפילה ושמחה לה’ לאכילה ולשתיה… וכשם שזכיתי וראיתי בחורבנה כך אזכה אני וכל ישראל לראות בנחמתה, אמן. Not surprisingly, many have called into question the authenticity of this letter. It appears, that the first mention of this purported letter is in Sefer Haredim, published by the noted 16th century Safed Kabbalist, R Elazar Azkari (see ספר חרדים, מצוות התשובה, פרק ג’). It gets even weirder; a very unlikely combination of Kabbalists, Hassidic Rebbes and Rambam’s own grandson, R David Ha-naggid, believed that Moses (Rabbenu) himself is also interred in the cave of the Patriarchs and Matriarchs in Hevron(!) see here. However, as mentioned previously, it appears from the Ari’s own writings that he was dead-set against visiting cemeteries. עכ”פ ע”פ הזוהר האיסור של דרישה למתים אינו קיים על קברי צדיקים, הבקשה מן הצדיק היא שיתפלל בעבור האדם, כיוון שצדיקים במותם נקראים חיים, וכמו שמצדיק חי ניתן לבקש שיתפלל כך ניתן לבקש מהצדיק אחרי מותו. At any rate, it appears from the Zohar, that the issue of ‘praying to the dead’ does not apply to the graves of holy men. Perhaps the Ari made an exception in those cases. It is these aforementioned fears that moved certain Halakhic authorities to either discourage or outright forbid praying at gravesites, as mentioned before. 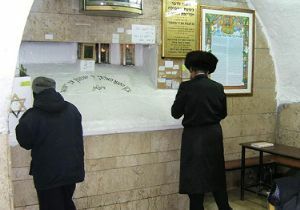 While the Royal Tombs of the Davidic Monarchs are often mentioned throughout scriptures, they never achieved particular esteem and their exact location is unknown to this day (the same goes for the tombs of the Hasmonean Monarchs and even the Judean nesi’im at Beth Shearim whose location is known, see here and here). The same is not true for many other Biblical gravesites, that are seen as sacred and authentic (to varying degrees), foremost among them is the Cave of the Patriarchs in the city of Hebron,- a site esteemed by all Jews, Muslims, Christians and Samaritans. The site is the only remaining Herodian edifice still intact in Israel and most scholars agree this is indeed the Tomb of the Patriarchs mentioned in scriptures and in Josephus. Other holy places that became sites of pilgrimage for many Jews (and adherents of other faiths of Abrahamic origin), include the Tomb of Rachel, outside Bethlehem, and the Tomb of Joseph is Nablus-Shechem. The authenticity of the latter two is hotly debated among both scholars and religious figures. Let us first focus for a moment on the Cave in Hebron. Nachmanides himself also visited the cave when he ascended to the Land of Israel. … “וא”כ גם במסגד של ערבים שאין שם ע”ז, ותפלתם להשי”ת ביחוד שאין בו דופי, אין שום איסור להתפלל שם, וכן ראיתי לכמה גאונים וצדיקים שהיו מתפללים בתוך המסגד של מערת המכפלה, ועד עכשיו יש שם בהכ”נ קבוע לתפלה, לאחינו תושבי חברון וקרית ארבע. “וכל זה כמובן בכנסיות שיש בהם צורות שתי וערב והם עבודה זרה, אבל מסגדי הישמעאלים אין חל עליהם האיסור זה כלל שאין הם עובדי עבודה זרה. ולכן, במערת המכפלה שיש שם מסגד נכנסים יהודים ומתפללים בו וה’ יקבל תפלתנו ברצון”. Since the post-Bibical period and particularly the post-Temple period, Jewish pilgrims made extensive efforts to visit the Land of Israel and especially its holy sites. These pilgrimages were very common among both Rabbinic and also Karaite Jews (in fact it may have been even more poplar among the latter; numerous such travelogues are extant from Karaite pilgrims to the Holy Land. Many pilgrims, perhaps influenced by the Muslim Haj ritual, took on surnames like ‘yerushalmi’ and ‘al-qudsi’ after completing such a piligrimage, see Kizilov, Matzevot). Read Bassoula’s entire travelogue here, or its english translation. הלכנו בדרך לקראת עיר רמלה ששם קבר שמואל ע”ה ובעה”ר לא הניחוני הישמעאלים להיכנס שם.. Thanks for the tip. Adding that to my growing list of books to read. It actually does ‘count for much’, i was thinking of adding this verse (along with others from Tanach, that hint of an afterlife and הישארות הנפש) but decided to leave it for a different post. By the way, it is this verse that roused the ire of Martin Luther (who rejected the catholic belief in ‘purgatory) and prompted him to remove it from the Christian Canon (Maccabees I and II, along with the “Feat of Judas Maccabeus” remains part of the Catholic Rite and many Eastern Churches…). Oh, I figured since most (all ?) Jews rejected the text as canonical (It is curious how Josephus in his history on The Maccabees essentially just copies an entire section of 1 Macc word for word…), that it wouldn’t count for much. Good to see that I was wrong. Indeed, Martin Luther rejected a number of texts for this reason, or another, but in particular Maccabees because it justified prayers for the deceased. Thank you for an excellent treatment of a topic surprisingly lacking in academic examination, considering the surprising explosion of its relevance in modern years thanks to growing hasidic and BT communities and their encouragement of grave-worship. יז [יח] שבע תענייות האלו–כל מקום שגוזרין אותם שם–אחר שמתפללין, יוצאין כל העם לבית הקברות, ובוכין ומתחננים שם: כלומר, הרי אתם מתים כאלו, אם לא תשובו מדרכיכם. ובכל תענית מתענייות הצרות שגוזרין על הציבור, מתפללין תפילת נעילה בכל מקום. ד ומציינין את הקברות, ובונין נפש על הקבר; והצדיקים, אין בונים להם נפש על קברותיהן–דבריהם הם זכרונם. ולא יפנה אדם לבקר הקברות. A decaying body is mere organic material; and conveying Tum’a no less. A person of achievement outlives their body through “dibhrehem,” of course, and for anyone else, the identification of their skeletal remains (if desired) requires a physical structure. As tourists who visit the old village of Susya near Hebron can see (if they find this more interesting than the high quality wine made there 😉 ), the old Judean practice was to bury the dead, and after a year store their remains in caves– visiting was the last thing on anyone’s mind. Later Babylonian associations of cemeteries with various harmful entities (“mazziq” and “shedh”, to the unwashed masses, are more or less the most effective warnings to avoid an area, whether for reasons of hygiene or to discourage an otherwise natural but harmful tendency) are more reflective of the rabbinic view of cemeteries than the Talmudh’s single, oft read out-of-context citation of Kalebh’s visit to the Cave of the Patriarchs by Rabha’ in ta`anith. טו [ז] חמישה הן הנקראין מינים: האומר שאין שם אלוה, ואין לעולם מנהיג; והאומר שיש שם מנהיג, אבל הם שניים או יתר; והאומר שיש שם ריבון אחד, אלא שהוא גוף ובעל תמונה; וכן האומר שאינו לבדו ראשון וצור לכול; וכן העובד אלוה זולתו, כדי להיות מליץ בינו ובין ריבון העולמים. כל אחד מחמישה אלו מין. the word “meliS” in the final category of minim is precisely the role which many have assigned to various patriarchs, matriarchs, and dead rabbinical authorities in their pursuit of more effective ways to get God to do what they want. The transformation of prayer into a kind of theurgy is of course its own separate, if related, topic, but the particular mechanism of grave-worship is a matter on which rationally-inclined Karaites and pre-Kabbalistic or non-Kabbalistic Rabbanites were in full accord. Hazaq wubharukh for the excellent and detailed post. Thank you Alex for this excellent comment. You are of course correct in your observations; as you put it: “One could as easily look at the ruins of a destroyed city for the desired emotional response” this is why some Aharonim write that in a case where there is no Jewish graveyard, one should visit a non-Jewish one (!). ה כִּי הַחַיִּים יוֹדְעִים, שֶׁיָּמֻתוּ; וְהַמֵּתִים אֵינָם יוֹדְעִים מְאוּמָה, וְאֵין-עוֹד לָהֶם שָׂכָר–כִּי נִשְׁכַּח, זִכְרָם. יט וְכִי-יֹאמְרוּ אֲלֵיכֶם, דִּרְשׁוּ אֶל-הָאֹבוֹת וְאֶל-הַיִּדְּעֹנִים, הַמְצַפְצְפִים, וְהַמַּהְגִּים: הֲלוֹא-עַם אֶל-אֱלֹהָיו יִדְרֹשׁ, בְּעַד הַחַיִּים אֶל-הַמֵּתִים. Can you think of more? I have a feeling I’m overlooking something in Mishle. I’m not so good at Mishle.